There were already operational problems in September when the Fed capped the limit on its reverse repo program, so in retrospect it isn’t all that surprising that it is being downplayed now. As the FOMC supposedly moves toward a rate increase, it is confronted with a very real problem in that the federal funds rate, the interest rate that has been primary monetary policy tool, is if not fully irrelevant than far more so than at any time since the 1970’s. The post-crisis world is one in which collateral dominates and unsecured interbank lending is a barren landscape of only the behemoths (and thus hopelessly fragmented as a means of transmission and effect). The reverse repo program, announced to much fanfare in September 2013, was supposed to allow the Fed to act more like the ECB producing a rate “corridor” with the IOER and reverse repo at the “floor.” The IOER itself was believed to accomplish that by itself back in 2008 when it was introduced (earlier than scheduled, I might add), but again this collateral regime pretty much assured its incomplete mandate (and the fact that the Fed thought it would succeed is a pretty damning indictment of the depth of knowledge in actual interbank plumbing during the worst crisis of the last seven decades or so). By 2011, the lack of volume in unsecured interbank lending, like federal funds, had at least some academic parts of the Federal Reserve System looking for an alternative approach. The effort that gained perhaps the most attention was a paper delivered by a couple of Federal Reserve Board economists at an ECB presentation. Titled, A target Treasury general collateral repo rate: Is a target repo rate a viable alternative to the target federal funds rate?, authors Elizabeth Klee and Viktors Stebunovs argued for replacing the federal funds rate with a blended sort of general collateral repo rate (GCF). The paper delves into the monetary mechanics behind using a repo rate for the primary monetary mechanism for both operations and signaling, anticipating a number of uncertainties and potential stumbling points. First, we show that there is a fairly predictable demand schedule for Treasury general collateral repo at both high and low frequencies. Second, the schedule is downward sloping, and the estimates of the schedule slope appear to be rather stable over time. In other words, a fairly stable liquidity effect is present in the repo market. We find though that the liquidity effect in the repo market is an order of magnitude smaller than that in the federal funds market before the financial crisis but is larger than that in the federal funds market after the crisis. Third, although, the demand schedule is rather flat, the size of the System Open Market Account (SOMA) portfolio of Treasury Securities relative to the repo market size is substantial, indicating that, in principle, the Federal Reserve can put significant upward pressure on the repo rate through large-scale reverse repos. In this situation, the general collateral rate may be steady or even rising, but that information may tell us very little about the state of repo or the success in the FOMC implementing its intended monetary effects. Again, the fatal flaw is that the SOMA portfolio will act as an effective arbiter of collateral shortages when it clearly does not. The last five months have shown that specifically and conclusively, along with magnifying the difference between GCF and special rates. If GCF rates are steady and only a few securities are trading “special”, that is at rates significantly below GCF because of high demand for that specific security or security type, then the GCF target is generally valid. But if the number of “specials” rises significantly, the GCF rate is the least important of the interest rates in question. When a repo trade ends in “fail”, either to deliver or to receive, in the treasury market it does so at an effective -3% rate (because of the 3% penalty that was implemented, only in UST repo, to get repo markets to “flow” collateral after totally seizing up in September 2008 with trillions upon trillions of steady fails). So no matter what the GCF rate might be, a wave of fails means that a significant proportion of the repo market is trading at negative rates, and even at -3%. That has been the state of the repo market since the ECB screwed with negative nominal rates all the way back in June. The SOMA holdings did absolutely nothing to prevent it, nor did the Fed’s mechanism alleviate the problem as it presented itself almost regularly in the weeks since. Worse, it is very likely that this repo problem contributed, if not playing a fully causative role, to the global “dollar tightening” that became disruptive and in some places disorderly during the same time. Obviously, no counterparty would be willing to lend funds into the market at a rate cheaper than that paid by the Fed. So by raising the overnight reverse repurchase rate, the Fed can raise the floor rate at which their counterparties are willing to lend to other, less safe, borrowers. Maybe we shouldn’t expect someone who ran the FDIC to understand actual repo mechanics, but “obviously” was a bad qualifier to something that was actually happening in defiance of everything that she wrote in that paragraph. Again, because of “specials” and fails the repo market has been trading well-below that assumed “floor” and quite regularly. If the SOMA-driven program doesn’t actually meet market demand for collateral, which is the primary consideration, not “currency” as these economists continue to maintain in their anachronistic tendencies, the rate will indeed do something other than the FOMC intends. In short, too many “counterparties would be willing to lend funds into the market at a rate cheaper than that paid by the Fed” because she has these priorities backward. 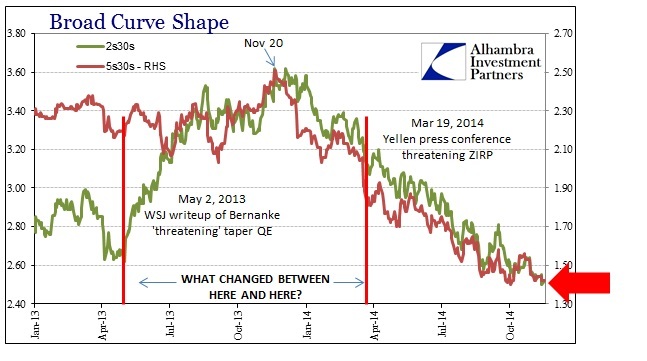 But as it turns out, getting back to the September 2014 cap on reverse repos, Bair’s main criticism seems to have been taken to the FOMC’s operation. Her concern was of a hypothetical whereby money market funds and non-banks would be overly dependent on the reverse repo to the deficiency of vital function. In what can only be an outward acceptance of that criticism, the cap on the reverse repo was undoubtedly an attempt to thwart that possibility. The alternative would have been to admit reality, which would be far worse in monetary policy terms. They would essentially confirm that they have no influence whatsoever on the rate “floor” in repo and that a target of the GCF or anything else would be more than useless; that the SOMA, vast as it may be, is so bureaucratically rigid as to be impractical and unserviceable to actual market circumstances. Worse than that, it would also mean what I noted above, that this inability to maintain their intended floor actually has dire downstream consequences (tightening) to all intents otherwise. Now the FOMC can move in without ever having to acknowledge as much, because Bair (and others) gave them a reason to do so without admitting their impotence. In the end, though, it may not matter because credit markets seem to be more than aware of the problems of this intended “exit”, judging more every day the growing possibility and potential for disruption and disorder; both financial and economic. Yet again, they don’t know what they are doing, but as long as the stock market continues to be ignorant of that they don’t seem much to care in such depth. That would certainly seem to offer a quite compelling explanation, certainly to my mind, about why stocks have so diverged from “bonds” especially since November 20, 2013 – the latter in concern over actual operation, with the former totally unconcerned about it, engrossed instead in only Pavlovian signals and psychology.